Delete: Removes an application profile (click its check box) if it is not currently assigned to a virtual service. Note: If the profile is still associated with any virtual services, the profile cannot be removed. In this case, an error message lists the virtual service that still is referencing the application profile. Neither can any one of the system-standard profiles (as illustrated below) be deleted. L4 SSL/TLS: Catch-all for any virtual service that is SSL-encrypted and not using an application-specific profile. 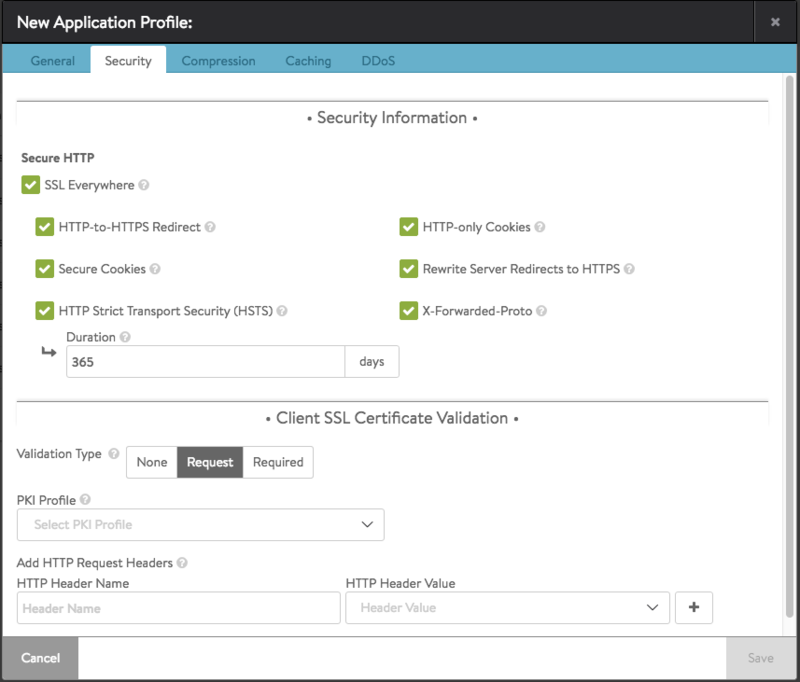 The HTTP application profile (which is the default) allows Avi Vantage to be a proxy for any HTTP traffic. HTTP-specific functionality such as redirects, content switching, or rewriting server responses to client requests may be applied to a virtual service. The settings apply to all HTTP services that are associated with the HTTP profile. HTTP-specific policies or DataScripts also may be attached directly to a virtual service. Save: Select another tab from the top menu to continue editing or Save to return to the Application Profiles tab. See also the Preserve Client IP article. HTTP Strict Transport Security (HSTS): Strict Transport Security uses a header to inform client browsers that this site should be accessed only over SSL/TLS. The HSTS header is sent in all HTTP responses, including error responses. This feature mitigates man-in-the-middle attacks that can force a client’s secure SSL/TLS session to connect through insecure HTTP. HSTS has a duration setting that tells clients the SSL/TLS preference should remain in effect for the specified length of time. This setting will activate only on a virtual service that is configured to terminate SSL/TLS. Rewrite Server Redirects to HTTPS: When a virtual service terminates client SSL/TLS and then passes requests to the server as HTTP, many servers assume that the connection to the client is HTTP. Absolute redirects generated by the server may therefore include the protocol, such as http://www.avinetworks.com. If the server returns a redirect with HTTP in the location header, this feature will rewrite it to HTTPS. Also, if the server returns a redirect for its own IP address, this will be rewritten to the hostname requested by the client. If the server returns redirects for host names other than what the client requested, they will not be altered. Note: Consider creating an HTTP response policy if greater granularity is required when rewriting redirects. This feature will activate only if the virtual service has both HTTP and HTTPS service ports configured. Avi Vantage can validate the certificates presented by clients, by checking them against a Client Revocation List (CRL). Further options allow passing certificate information to the server through HTTP headers. Matching Rules: determine if the client (via Client IP or User Agent string) is eligible to be compressed via the associated Action. 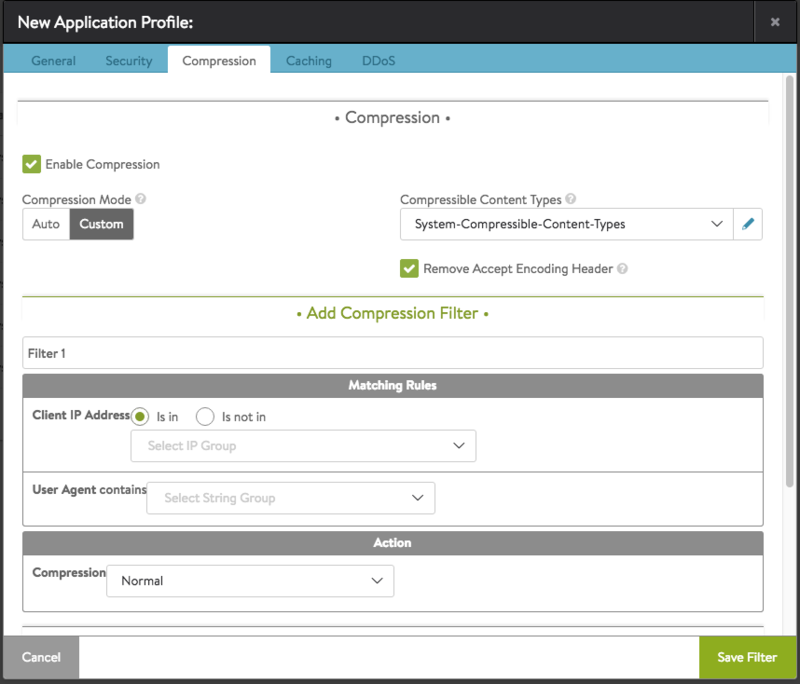 If both Client IP and User Agent rules are populated, then both must be true for the compression action to fire. User Agent matches the client’s User Agent string against an eligible list contained within a String Group. The User Agent is a header presented by clients indicating the type of browser or device they may be using. The System-Devices-Mobile Group contains a list of HTTP User Agent strings for common mobile browsers. 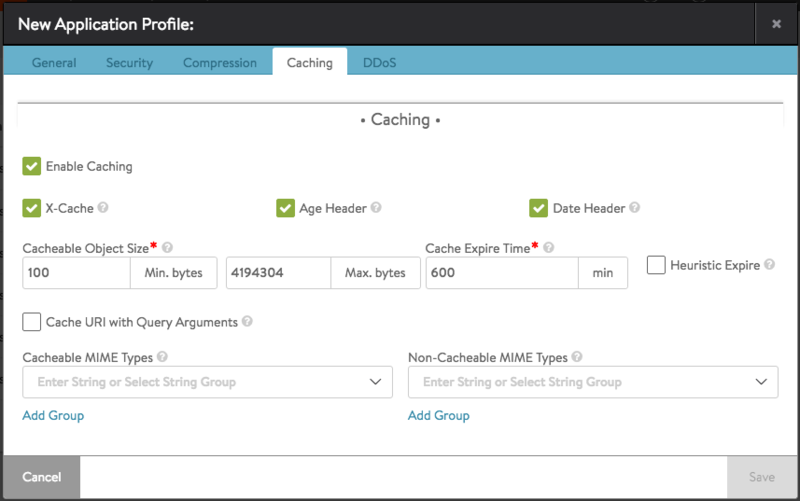 By default, caching is and appears off, as shown at right. Click the box to enable caching. The first step in mitigating HTTP-based denial of service attacks is to set parameters for the transfer of headers and requests from clients. Many of these settings protect against variations of HTTP SlowLoris and SlowPOST attacks, in which a client opens a valid connection then very slowly streams the request headers or POSTs a file. This type of attack is intended to overwhelm the server (in this case the Service Engine) by tying up buffers and connections. Clients that exceed the limits defined below will have that TCP connection reset and a log generated. This does not prevent the client from initiating a new connection and does not interrupt other connections the same client may have open. Send Keep-Alive header: Check this to send the HTTP keep-alive header to the client. Use App Keep-Alive Timeout: When the above parameter is checked such that keep-alive headers are sent to the client, a timeout value needs to be specified therein. If this box is unchecked, Avi Vantage will use the value specified in the HTTP Keep-Alive Timeout field. If it is checked, the timeout sent by the application will be honored. A DNS application profile specifies settings dictating Avi Vantage’s request-response handling. By default, this profile will set the virtual service’s port number to 53, and the network protocol to UDP with per-packet parsing. 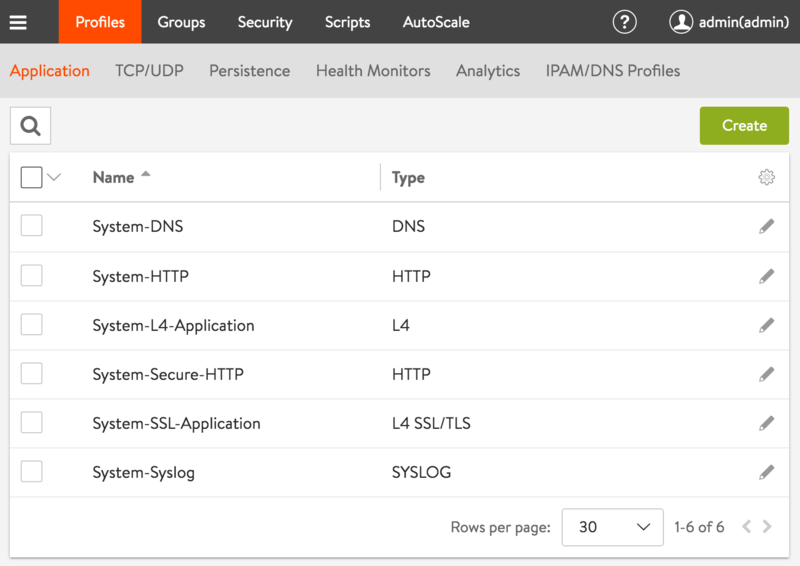 Number of IPs returned by DNS server – Specifies the number of IP addresses returned by the DNS service. Default is 1. Enter 0 to return all IP addresses. Otherwise, the valid range is 1 to 20. Subnet prefix length – This length is used in concert with the DNS client subnet (ECS) option. When the incoming request does not have any ECS and the prefix length is specified, Avi Vantage inserts an ECS option in the request to upstream servers. Valid lengths range from 1 to 32. Process EDNS Extensions – This option makes the DNS service aware of the Extension mechanism for DNS (EDNS). EDNS extensions are parsed and shown in logs. For GSLB services, the EDNS subnet option can be used to influence load balancing. EDNS support was added in Avi Vantage 17.1.3. TTL – The time in seconds (default = 30) a served DNS response is to be considered valid by requestors of the DNS service. Valid range is 1 to 86400 seconds. (Options for) Invalid DNS Query processing – Specifies whether the DNS service should drop or respond to a client when processing its request results in an error. By default, such a request is dropped without any response, or passed through to a passthrough pool, if configured. When set to respond, an appropriate response is sent to the client, e.g., NXDOMAIN response for non-existent records, empty NOERROR response for unsupported queries, et cetera. Respond to AAAA queries with empty response – Enable this option to have the DNS service respond to AAAA queries with an empty response when there are only IPv4 records. 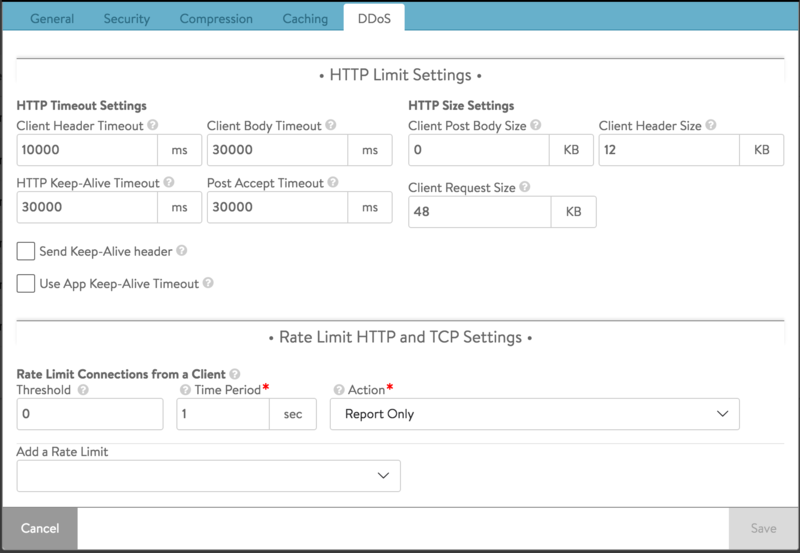 Rate Limit Connections from a Client – Limits connections made from any single client IP address to the DNS virtual service for which this profile applies. The default (=0) is interpreted as no rate limiting. Threshold – Specifies the maximum number of connections or requests or packets that will be processed in the time value specified in the Time Period field (legitimate values range from 10 to 2500). A higher number will result in rate limiting. Specifying a number higher than 0 makes the Time Period field mandatory. Time Period – The span of time, in seconds, during which Avi Vantage monitors for exceeded threshold. The allowed range is from 1 to 300. Avi Vantage calculates and takes specified action, if the inbound request rate is exceeded. This rate is the ratio of maximum number to the time span. Action – Choose one of three actions from the pulldown to be performed when rate limiting is required: Report Only, Drop SYN Packets, or Send TCP RST. Preserve Client IP Address – Click this option ON to have the client IP address pass through to the back end. Be sure you understand what the back-end DNS servers expect and what they will do when offered the client IP address. This option is not compatible with connection multiplexing. Valid subdomains – A comma-delimited whitelist of subdomain names. Identifies the subdomains serviced by the DNS virtual service with which this profile is associated; all others will not be processed. This option’s best use is in the context of GSLB, in which the GSLB DNS’ sole purpose is to return IP addresses corresponding to the global applications being served. Valid subdomains are configured with ends-with semantics. Authoritative Domain Names – A comma-delimited set of domain names for which the GSLB DNS’ SEs can provide authoritative translation of FQDNs to IP addresses. Queries for FQDNs that are subdomains of these domains and do not have any DNS record in Avi are either dropped or an NXDOMAIN response is sent (depending on the option set for invalid DNS queries, described above). Authoritative domain names are configured with ends-with semantics. Note: All labels in subdomain and authoritative domain names must be complete. To illustrate by example, suppose alpha.beta.com, delta.beta.com, delta.eta.com, and gamma.eta.com are valid FQDNs. If we intend the GSLB DNS to return authoritative responses to queries for each of the four FQDNSs, two authoritative domains could be identified, beta.com and eta.com. It is not sufficient to stipulate eta.com alone because “eta” is not a complete label, and therefore doesn’t match either alpha.beta.com or delta.beta.com.